The hotel is within walking distance of all main attractions of Belfast city centre, including the shopping and nightlife districts.Titanic Belfast, City Hall and Odyssey Arena are also right on your doorstop The birthplace of the RMS Titanic and the capital of Northern Ireland, Belfast is a vibrant city with a rich culture and history. Unmissable attractions include the beautiful Botanic Gardens, Titanic Belfast, the SSE Arena and Belfast City Hall. Ibis in general meets our expectations and Ibis Belfast did just that. Clean, comfortable beds and good service overall. Thank you. Great hotel, great location for shops, bars ect. Hotel very clean, rooms small but very cosy, great breakfast. Room were cozy and all the staff were very helpful and cheerful. The staff was very helpful but we had to park across the street. It was difficult to find the hotel.We drove around for HOURS. Hard to figure how to get to the parking spot. 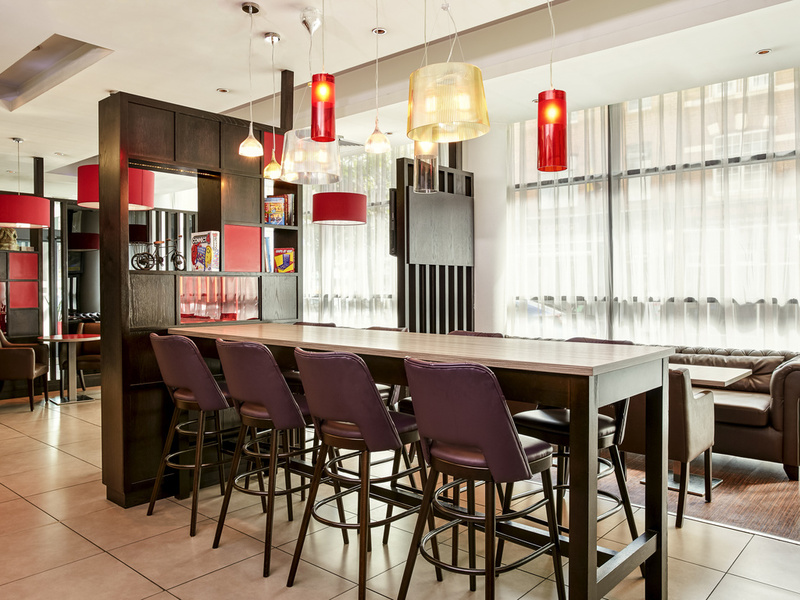 Modern, clean hotel situated right in the city centre, located just off the motorway. Parking only £6 next door for 24 hours. Staff very friendly and breakfast was lovely. We really enjoyed our stay at the ibis. The room was clean and spacious. Just two small issues - the bath towels were of poor quality and not big enough to get dried with. And each time our room was cleaned we were unable to access it with our room key card - the card had to be re-activated by a staff member on reception. Very clean room, exceptionally helpful staff, right in the heart of Belfast, loved it!! Had to be moved room because of noise. Tap water smelled of sewage. Everything else was fine. I've stayed in many ibis hotels and they provide exactly what it is needed, a clean good sized room with adequate bathroom facilities and breakfast provision, ibis Belfast was as expected, the staff were friendly but not obtrusive. it was fine. Although - i was told to provide my address should i leave anything in my room and I am yet to receive a note telling me if i will received my iphone charger in the post? I can’t fault one thing. Amazing room, great staff. Overall a great experience. Very good. Nice room. Bed was comfortable but could have done with a harder pillow but thats just being picky. Staff were extremely helpful and my room was tidy and clean. I did not have a fried breakfast but I really enjoyed other offerings. Does what it says on the tin: cheap, comfortable, friendly. Good stay, dampened by tryin to overcharge us, while checking out. All in all a good stay, room was clean, bed was comfy etc the only thing that let the experience down was being over charged at checkout. We where asked if we would like to add breakfast on at 6.95 or it would cost 8.95 if we wanted to pay for it on the day. Although we asked for it to be added on, where still billed 8.95. I know it’s only 2quid, but the wife only had a slice of toast, scrambled egg and a cup of tea. Other than the dispute with the bill, which I feel could have maybe been handled a bit more professional, the hotel was clean and tidy. We stayed for two nights and were very impressed with the hotel. Staff were friendly and helpful, the room was clean and comfortable; the location was central and for the price we were very happy with the overall experience. Can definitely recommend this hotel and would consider staying here again. A good location within easy reach of the centre of Belfast (City Hall etc) as well as such places at the Opera House, the National Trust's Crown Bar. Friendly and helpful welcome and staff with good breakfast choice. Probably not great for an evening meal, but there are plenty of other places within walking distance. Dear RAB140, Thank you firstly for choosing our hotel and for sharing your experience with us on tripadvisor. I am delighted to see you found our location to be convenient to the places you wanted to visit, we are indeed very fortunate to be located so centrally. Its great to see our friendly and helpful team were able to contribute to making your experience a positive one, we do offer a wide variety of fully cooked and continental breakfast items, we do also however offer a range of beautiful evening meals also, we hope you'll come back to stay with us again soon and try one. - remember to sign up free of charge to the Accor loyalty membership scheme to avail of the exclusive members discounts and various other perks and privileges when booking directly through the Accor website, (not just in our hotel but every Accor hotel worldwide). Thank you again for sharing your experience with us and we hope to welcome you back again very soon. Kind regards Emma McElkerney Front Office Supervisor. I stayed 1 night, and from start to finish no issues, checked in and was allocated a room on the 9th floor, nice and quiet, just perfect, also the staff were able to accommodate a late check out, so I could take my time on the Sunday morning, fantastic service. Room was fantastic, Ibis hold to a great standard, and I wasn't disappointed. I also wanted to congratulate the hotel on reducing environmental impact, far too many hotels have individual bars of soap in plastic wrappers, plus having a fascination with having plastic cups in the bathroom, again surrounded by a plastic wrapper, it baffles me how a hotel with 100+ rooms on average, many more, for a standard double room, uses 4 plastic wrappers per day per room (2 soaps, 2 cups) , that's 145,000+ pieces of plastic wrapper per year, and many of these hotels are in Belfast, and might I say are other hotels in the Ibis brand. So it was encouraging to see when I arrived at my room, that soap was in a dispenser and the 2 cups were paper with 100% biodegradable on the side, without a plastic wrapper in sight, so much so I took a photograph to show some of the other hotels I visit, this is how it's done, there is no reason why they can't hold to the same environmental standard. Overall I'm very much looking forward to my next stay at your hotel.